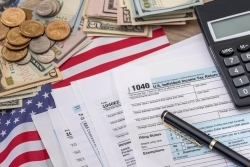 At Milbery & Kesselman, CPAs, LLC, we keep up with changes in the tax laws and are always looking for new ways to help our clients keep more money in their hands, instead of sending it to the IRS. Whether you own a small business or are an individual, we have the skills to prepare your taxes in compliance with all Federal and State tax laws. We offer prompt, efficient preparation of all types of returns including corporate tax filings, multi-state taxes and individual income tax returns. In addition to traditional tax returns, we're qualified to prepare trust, gift and estate tax returns, for both Federal and State. We meticulously prepare these types of returns and file them on time to avoid penalties. United States citizens working across the border in Canada, Mexico, or overseas, need specialized tax preparation services. We're experienced in international tax law and can prepare these types of tax returns and file them electronically. Call us at 954-583-3223, ext. 101 and ask for Jack Milbery today or request a free consultation online to learn more about our Fort Lauderdale, FL tax preparation services.